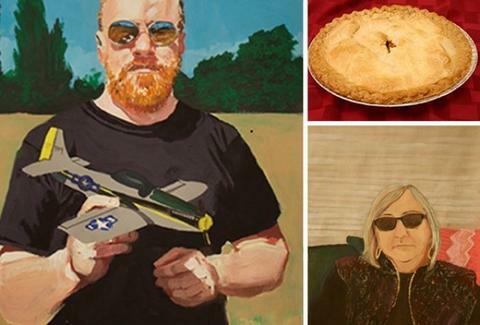 Get a custom work of art and... a pie! There comes a day in every man's life when he realizes that science simply isn't evolving fast enough, and that he will never show up to work riding on the back of a triceratops. This is a very sad day. Now for a happy one: today, when you realize you can wake up to that image for eternity, and get a pie out of it too, if you order a custom portrait from Emily Weston. An art-school grad who works in television and film by day, Emily will consult on your completely unreasonable vision of yourself, then create a gouache, acrylic, or watercolor portrait that can go one of two ways: either a traditional-style still (borrrring! ), or, if you're totally awesome, something more along the lines of that triceratops one mentioned above. To get started, tell her what kind of setting you want to be immortalized in (literally anything you can dream up), then get her a bunch of photos to provide an idea of your general look/unique qualities (e.g., trademark crooked smile, totally badass No Fear shirts), after which she'll get to work, then touch base frequently over the three-week creation process to ensure you get exactly what you were searching for, unless that's Bobby Fischer. She doesn't know where he is. And don't forget the pie! Inspired by the times she baked for musicians who recorded in her hubby's studio, Em will give anybody who says they read about her on Thrillist a piping hot, homemade apple pie, because there comes a day in every man's life when he realizes he just had a perfect portrait of him made for posterity, so now he can eat pies and get fat.